CHICAGO - The Mets had looked at their young rotation way back in spring training, throwing side-by-side in the six-pack bullpen at Tradition Field, and dreamed big. Under the brilliant Florida sun, hearing the pop of the catcher's mitt, seeing the wide, easygoing smiles. So much talent, so much promise. And what seemed like limitless potential. 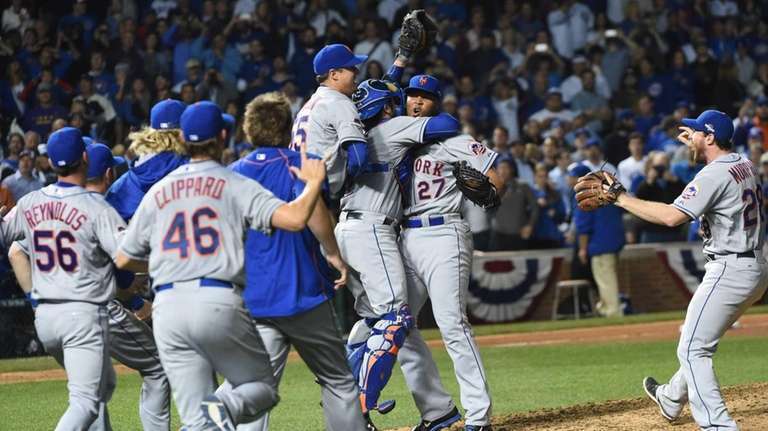 With 162 games in front of them, these Mets' arms already had people thinking a deep October run. If they got there, the argument went, this rotation would make them a very dangerous team. But that felt like a very big if. Playoffs? Seriously? Absolutely. Little did we know, that was only the beginning. Behind their Big Three, along with Steven Matz in more of a supporting role, the Mets not only arrived ahead of schedule, but have stormed their way through the postseason, and were on the brink of clinching a World Series berth heading into Wednesday's Game 3 of the NLCS. It's not just about power, either. We've marveled at Noah Syndergaard's 101-mph fastball, the pitch that had Dodger Stadium fans betraying themselves by oohing and ahhing as they eagerly checked the scoreboard readings. Jacob deGrom has displayed more heart than any radar gun could measure. Matt Harvey stepped up to put the controversy behind him. For Matz, he's had some catching up to do. With just six major-league starts on his resume, Matz was a rare breed in making the Game 4 start. Only the Phillies Marty Bystrom had fewer (five) before taking the mound in an LCS -- for Game 5 in 1980. Some of that inexperience probably showed Wednesday night, as Matz motored through the Cubs until the fourth inning, when he gave up his first hit, a leadoff double to Jorge Soler. To that point, Matz had retired nine of 10, with three strikeouts, and his 95-mph fastball was being complemented well by a sharp curve ball and changeup. The Cubs trimmed their deficit to 6-1 that inning on Kyle Schwarber's RBI groundout, but Matz stopped the damage there. In the fifth, however, Matz got burned when three Mets allowed Dexter Fowler's pop-up near the rightfield line drop for a two-out single. When Soler followed with another hit, Terry Collins pulled Matz after 76 pitches. There would be no fairy-tale ending on this night for Matz, the former Ward-Melville star who also is the only New York born pitcher -- city or state -- to make a playoff start for the Mets. While it's been a magical playoff ride for this team, that particular plotline will have to wait for another day. We expect Matz will get another chance. The Mets' rotation showed as much character as ability, and that ingredient has helped set them apart through the first two rounds of these playoffs. It's easy to forget this is the first postseason for this group, one that has been completely unfazed by the big stage. But for the front office that put them together, it didn't happen by accident. This is not an overnight success story, and the careful planning, with a cautious eye on development, is what created the Mets' young-gun phenomenon. "We were pretty patient," assistant GM John Ricco said before Wednesday's Game 4. "We said all along we want to bring these guys up when they're ready -- ready to excel. And I think that's what you're seeing. We're being paid the dividends now for that. They're hard throwers, but they're not just throwing. They're pitching." And doing it extremely well. Heading into Game 4, the Mets' rotation was 6-2 with a 2.72 ERA, including 65 strikeouts and only 16 walks in 492/3 innings. The achievement goes beyond the stat lines, however, as deGrom matched Jerry Koosman for consecutive playoff wins with three -- and twice had to battle back from early trouble. Part of that is being fearless, and this is not a group that is scared of beating hitters in the strike zone. That quality definitely makes Terry Collins' life less complicated. They also appear to be well-rested for the bigger things ahead, thanks to the meticulous, and often headline-creating protocol the Mets followed to get their rotation here in one piece. "I'm not looking for vindication," Collins said. "We had some controversy along the way, but it comes with the territory for me." With a chance at a World Series ring next on the agenda.